Promotional flexi fit hats are the latest fashion to date and they are quite funky in their free sized, unisex and stylish looks while they coordinate well with outfits. This kind of hat is stretchable to fit the head and is in sharp contrast in style with the other two popular styles including the standard sizes fitted type and the grip strips for the free sized type. This type of hat carries a big sized logo on the front side and a small sized in the back side. 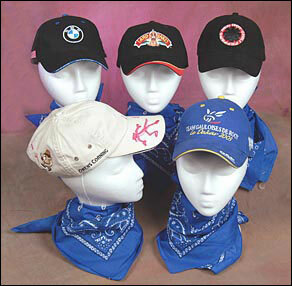 Generally, in promotional activities for events, this type of hat is given to the customers and employees to create a brand consciousness for the brand and to use as a fashion trend for the company. Material wise, this type of hat is made mainly out of a mix of spandex and other materials such as washed cotton twills, wool blends, polyester brushed cottons, polyesters, brushed cottons, and stonewashed cottons. Spandex is a material that is elastic that converts normal sized hats into flexi fits irrespective of the wearer’s head size. This is a very popular promotional tool, mainly used in sports game shows, giveaways kind of events, gifts for a corporate hi tea parties, or a beach party, and is used to impress the customer with a token of the company’s gratitude and for the purpose of long term brand advertisement. The promotional flexi fit hats are specifically designed and custom made. In fact, the manufacturer of these kinds of promotional hats keeps a lot of samples and proposed designs for the hats depending on the budget of the company and the type of the promotional event. If the organizing company has any choice about the design, color, placement of logo it naturally gets preference otherwise the hat manufacturer has enough expertise to make a design to fit the purpose. Spandex used here as it gives a touch of flexibility in the hat and the embroidery adds a flavor of uniqueness to it. If the parent company has no choice, then the hats are made in bright colors with the corporate or company logo. These days, the companies that design the hats keep a preview tool of the proposed hat design so that the company who is making the hats can look at the hats to be produced hats. There is the possibility of making this type of hat using a range of different kind of materials, but out of all of them cotton the blended materials are the most popular throughout the year while wool and polyester blended materials are used for the events that take place during the wintry and rainy seasons. Previously the logo of the company that made the hat was printed on it, however, now it is corporate logo that goes on it. It gives an exclusive look to the hat and the wearer feels like they are wearing a designer hat. Therefore, the day to day use for this kind of hat is being increased for promotional purposes.